I just received the Witch Trio stamps from Starving Artistamps - what a fun batch of Halloween images! 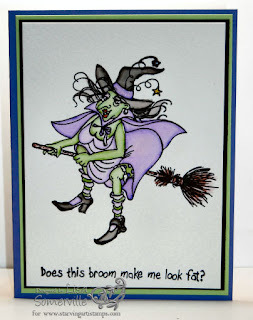 Here's a quick card using the Marker Watercoloring Technique and one of the witches and sentiments from the Witch Trio plate. If you weren't one of the lucky winners of the recent Blog Candy at Starving Artistamps - or haven't ordered yet - then I have a treat for you - SAVE 10% on all Starving Artiststamps Stamps or DoodleFactory Stamps when you shop and use code savetenLS at Starving Artistamps. She is the funniest witch I think I have ever seen. Infact she is the funniest! That set cracks me up. I like the one about the broom wedgie too! Cracks me up! This is HYSTERICAL! Great card, I love that you didn't overload it with embellishments...it's just perfect on its own!